The BEST moist yellow cake recipe I’ve ever had, probably because there is one unusual ingredient: brown sugar. It makes the cake less traditional but a lot more MOIST. (Hallelujah!) 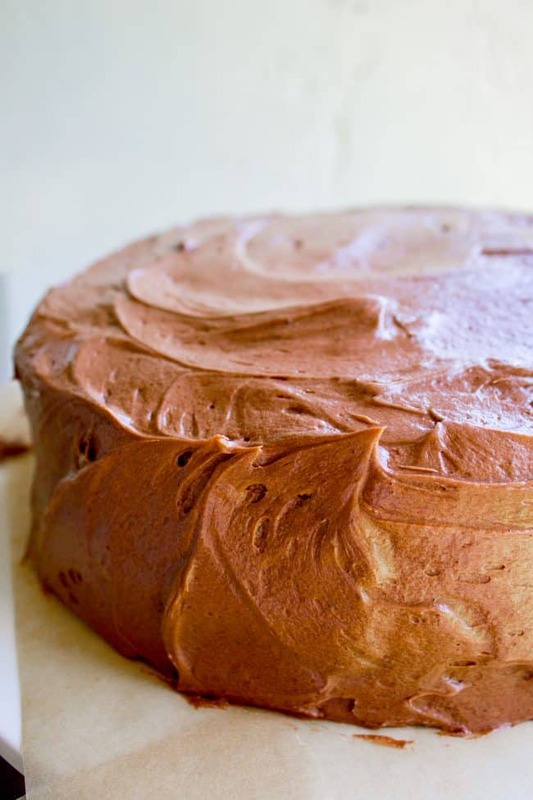 I’m in love with this brown sugar yellow cake and the ridiculous amount of chocolate frosting that goes with it. I looked up a couple other yellow cake recipes just to see what kind of disaster Shannon was in for when she tried to omit the cocoa from my chocolate cake. And I was shocked to find that my chocolate cake recipe is almost identical to several yellow cakes I found–same butter amount, same liquid amount, same flour, etc. But instead of using all white sugar, my cake has half white sugar and half brown sugar. When is brown sugar EVER a bad idea?? 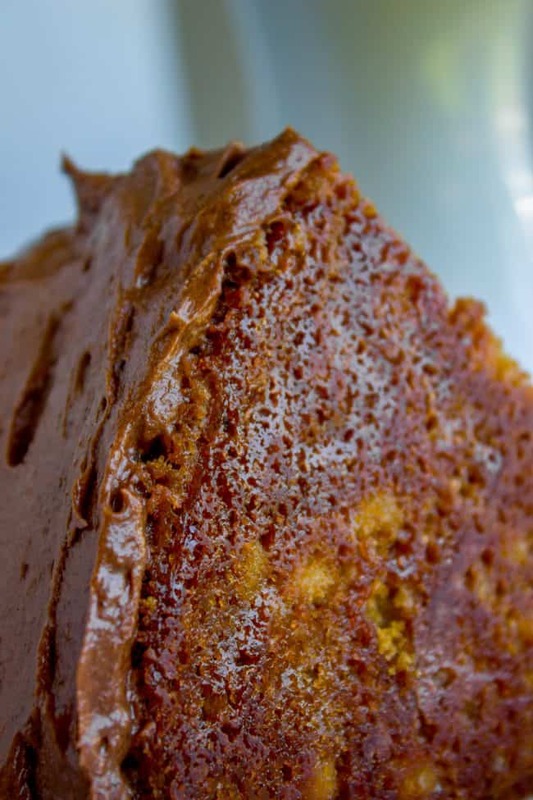 The method for this brown sugar yellow cake is different from your average yellow cake. First you boil some water and butter together (that’s part of what gives it that fudgy texture). Then you stir together the dry ingredients, and add the baking soda and baking powder to the eggs. It’s a little odd, but the result is a brown sugar flavored yellow cake that is incredibly moist. As I say about the original chocolate cake, the edges are almost brownie like, but somehow still manage to be cake. There are no dry edges. There’s a reason I’m including a photo of the non-frosted underside of this cake. The edges are unreal, even when they don’t have frosting on them. Do you guys have any weekend plans? We’ll just be doing the usual, yard work and church on Sunday. Sometimes I love having no plans for the weekend. We just got back from a kid-free 2 week vacation in Australia, so we’ve been spoiled anyway. (And yes, it was so fun!!) I hope you get to make this Chocolate Free Chocolate Cake soon! Six years ago: Mud Hen Bars < merigue. It’s so good! The BEST yellow cake recipe I've ever had, probably because there is one unusual ingredient: brown sugar. It makes the cake less traditional but a lot more MOIST. (Hallelujah!) 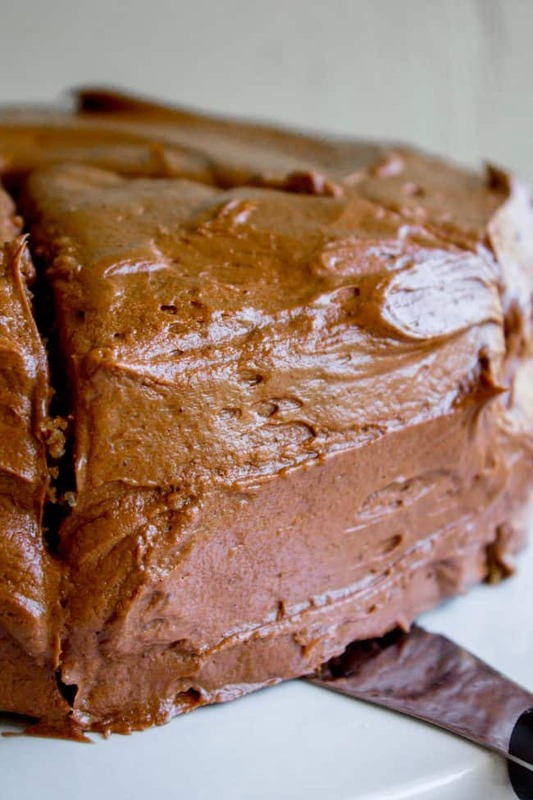 I'm in love with this brown sugar cake and the ridiculous amount of chocolate frosting that goes with it. Preheat oven to 325 degrees F. Grease 2 9-inch cake pans with butter or nonstick spray, then coat with a small amount of flour, tapping out the excess over your sink. Then trace the bottom of the cake pans onto parchment paper, cut out the circles, and put them in the bottom of the pan. In a medium saucepan, melt 1 cup butter over medium heat. Stir in the water and whisk until combined. Bring to a boil over medium heat and boil for about 30 seconds. Remove pot from heat and let sit aside to cool. Meanwhile, in a large bowl, whisk together the white sugar, flour, and 3/4 teaspoon salt. In another medium bowl, whisk together 2 eggs. Slowly sprinkle baking soda and baking powder over the top while you whisk. Beat until there are no lumps. The mixture may foam, and that's ok! 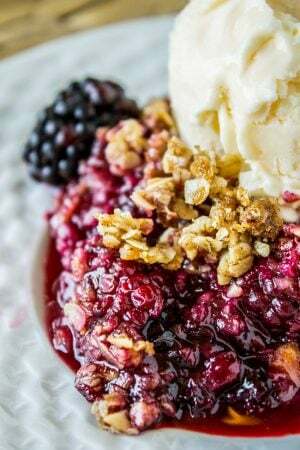 Stir in 1 tablespoon of vanilla bean paste and 1 cup brown sugar. When the butter mixture in the pot has cooled enough to handle, stir it into the flour mixture. Then add the egg mixture. Each time mix only until combined. Lastly, fold in the sour cream. DON'T over mix!! Divide the batter evenly between the 2 prepared pans (I use a scale to make sure they were even). Drop the cakes on the counter from a few inches above to get out some of the air bubbles. Bake at 325 for about 34-40 minutes, rotating the pans halfway through. Remove from the oven when a toothpick comes out of the center clean. Let cakes cool in the pans for 10 minutes, then carefully loosen edges with a knife and invert onto a cooling wrack. Let cakes cool completely. In a large bowl or stand mixer, use the whisk attachment to cream the butter for 2 minutes, scraping the sides and bottom of the bowl. Add the cocoa and 4 cups of powdered sugar in increments, adding the cream in between. Beat well after each addition, scraping the sides of the bowl often. Add the salt and vanilla bean paste. Beat well. Add the 5th cup of powdered sugar if you like. Frosting consistency is kind of a personal preference, and sometimes it depends on my mood! Smear a bit of frosting on the bottom of a cake plate. 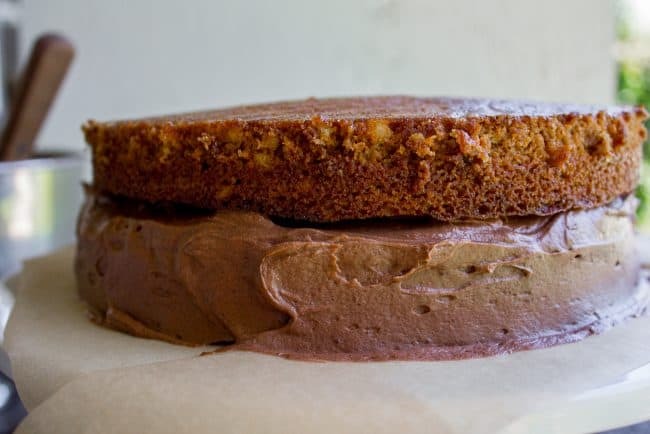 Place 1 cake on top, then cover the top with about 1 cup of frosting (I like to use an offset spatula). Place the other cake on top, then frost the outside and edges. 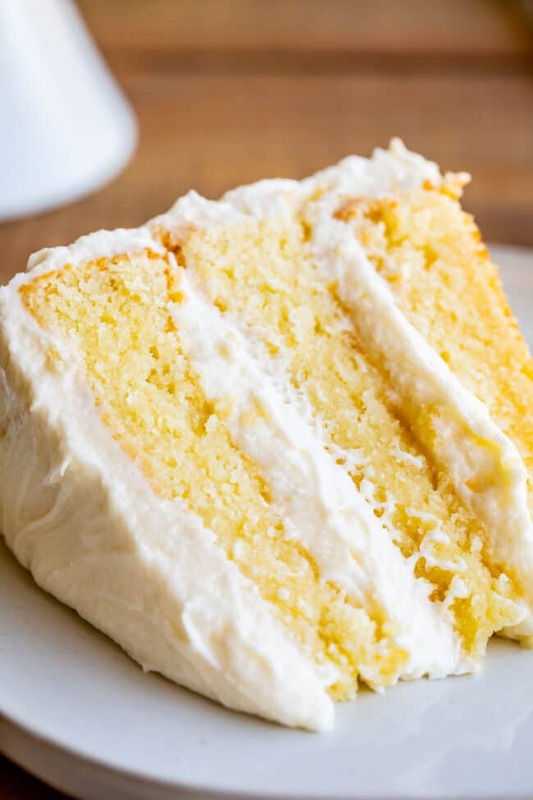 If you don't want your cake plate to get frosting all over it, line the bottom cake with strips of parchment paper that you can pull out when the cake is completely frosted. 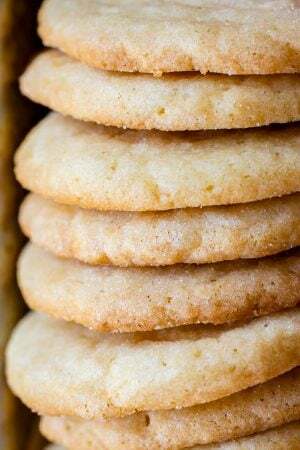 *You can use regular vanilla extract in place of the vanilla bean paste. It will still taste great! 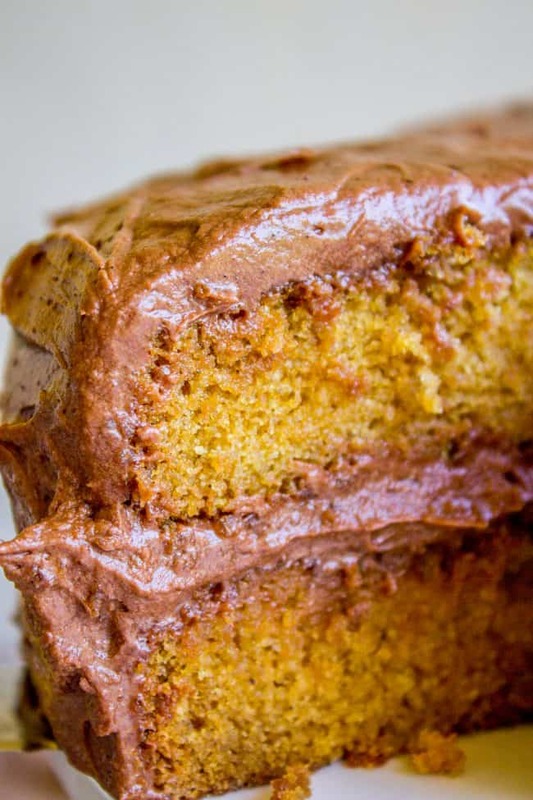 More cake recipes you need to try! The Best Chocolate Cake I’ve Ever Had << I still make this claim. It’s almost exactly today’s recipe, except with chocolate. It’s so moist it’s brownie-like, while still being cake. 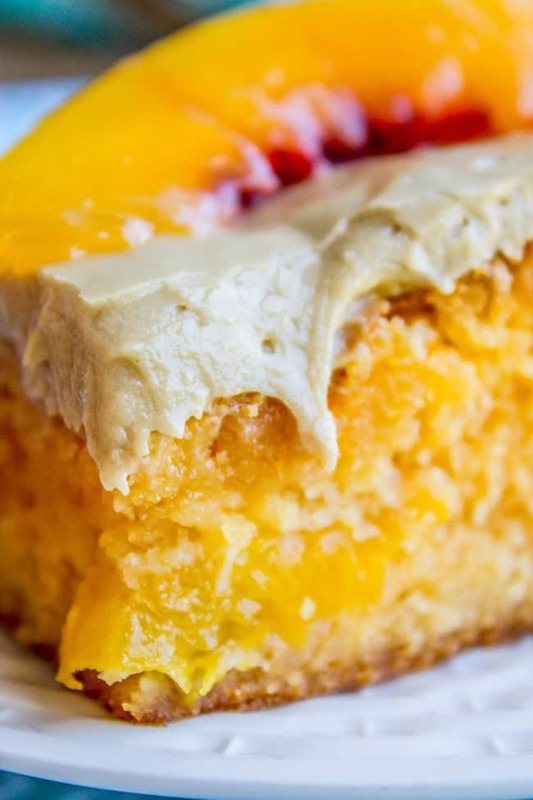 Peach Cake with Brown Sugar Frosting << this cake is delicious and uses frozen peaches! Upside Down Almond Crunch Cupcakes << why are we still frosting the tops of cupcakes? Turn those babies upside down for triple the frosting. 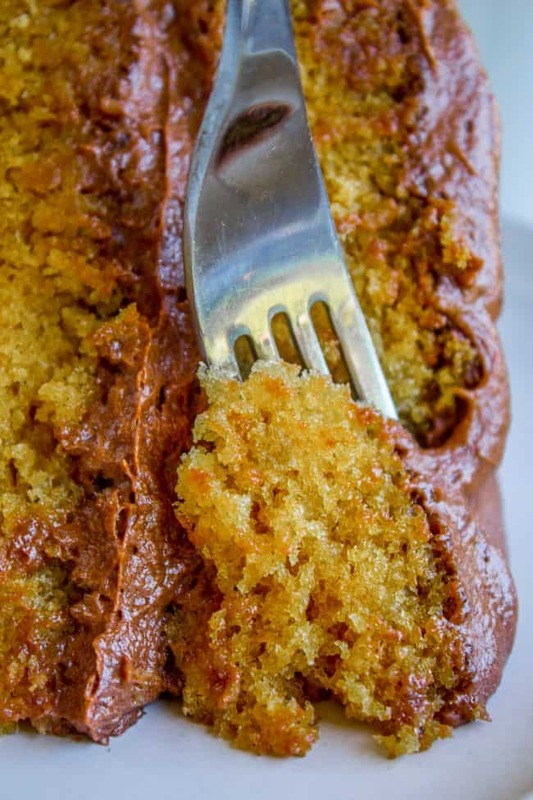 More yellow cake to love from other bloggers! I baked this cake today, but made my own faux chocolate frosting (carob powder instead of cocoa powder). 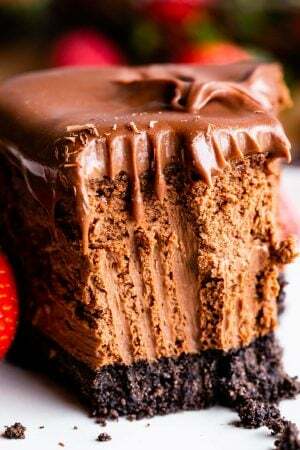 It’s quite moist and so very delicious! Thank you for sharing! Hey Marsha, I’m so glad you liked the cake! That’s a great idea to sub carob powder, I’ve never tried that. Thanks for the tip! Does this work in 2 8in pans well? Hey Coco! Yes I think 2 8inch pans would work great! You may have to adjust baking times so keep an eye on it. I hope you love the cake!! 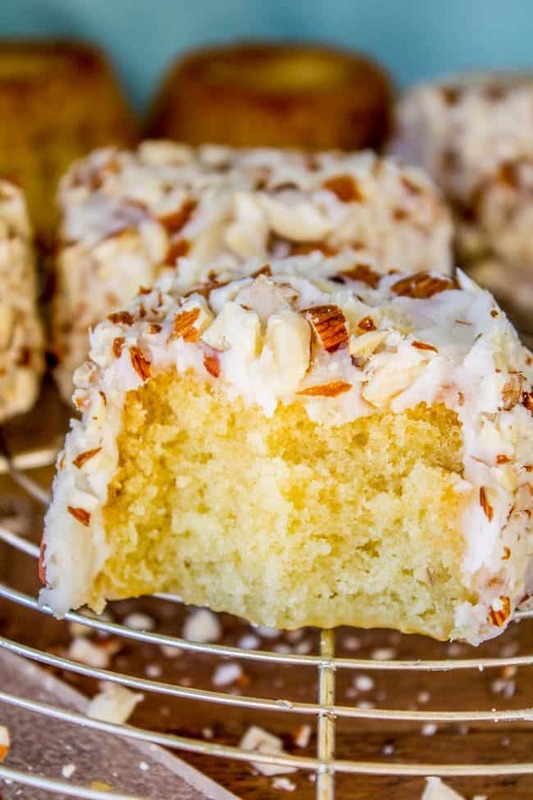 It seems to be one of the most delicious cake recipes I have ever seen. I’ll try it out. It’s a good one Edvaldo! You are going to love it! This cake turned out moist and buttery. Loved it! Followed cake recipe as is; used my own chocolate icing recipe. Hey Heather, that’s awesome! So glad you liked it and that it turned out moist. Nobody likes a dry cake :) Thanks for commenting!! I made this cake for a bake sale. It turned out more like a pound cake, but the flavor was still wonderful! The frosting is the best EVER! I sold every piece at the sale and got lots of compliments. Hey Kayla! I’ve never tried it this way so I can’t be sure. If you plan to do a light fruit topping, I think it will be okay, but I would definitely serve it right away after adding the topping. Let me know how it goes! Haha, no worries Sandy! How did the cake turn out? I hope you loved it as much as I do! With the Brown sugar yellow cake, can this have a substitute for the vanilla bean paste? This is currently in my oven. 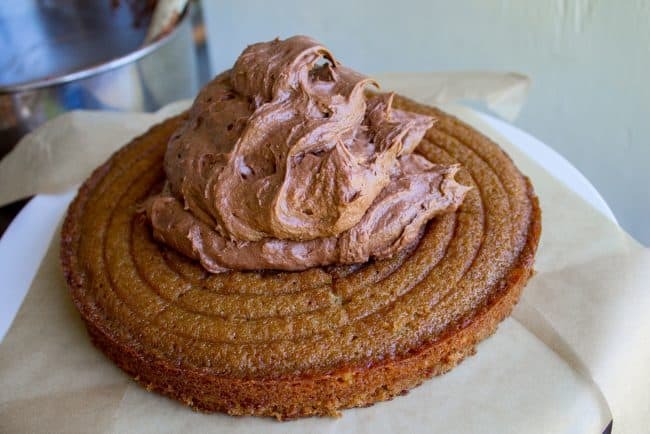 My husband has been begging for a yellow cake/ choc frosting… And after my last one had a key ingredient missing (shame on me) he requested this. He has had a rough day and I certainly hope this brings a smile to his face tonight!! Thanks for the recipe! I hope it brings a smile to his face too Jess! I’m glad you picked this recipe, I think he will love it. Let me know how it goes! I made the cake on the weekend and it was a huge success. Everyone loved it. Very moist and the icing was a hit. Thanks so much. Can I make cupcakes using this recipe. I like to bake for my co-workers. Made this for my dad’s birthday, everyone raved about it. Awesome flavours!! DUDE. This looks ridiculous. The frosting to cake ratio looks perfect to me! I may have to make this on Sunday. 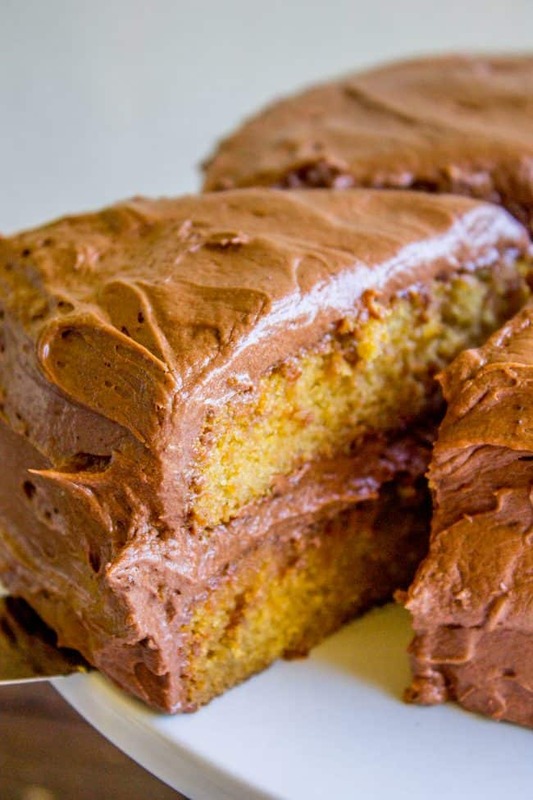 I’m usually all about chocolate but I do love the yellow cake chocolate frosting combo. 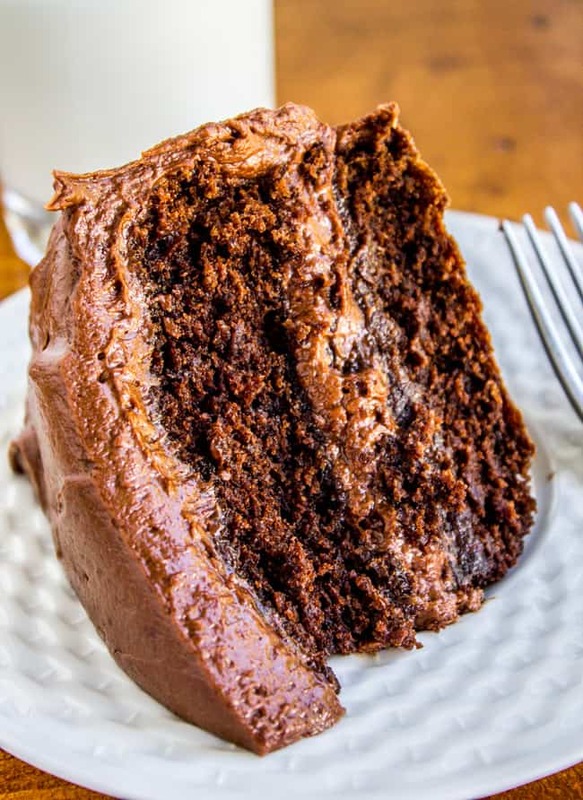 I know, I always think I’m a die-hard chocolate cake fan, but when someone hands me a super moist yellow cake with a ton of chocolate frosting…mm. Let me know if you try it!! Hey Susan! I’m sorry you weren’t able to pin! Thanks for letting me know. I can’t figure out what’s wrong, it seems to be pinning fine when I try it… here is my pin, can you pin it from here? https://www.pinterest.com/pin/117656608999430526/ I hope you get to try the cake soon! !